In order to give our clients the best possible service our offices will be open during the festive break. Our offices will be closed from 4pm on Friday 22nd December and will re-open on Wednesday 27th December at 10am. Normal 9am to 5pm office hours will resume when we return to work on 2nd January. The Four Oaks team wish you, your family and friends a very Merry Christmas and Happy New Year. 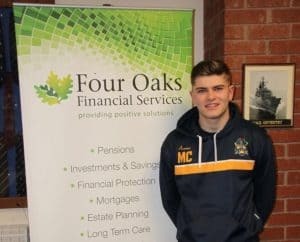 We are delighted to announce that we are sponsoring Matt Coleman, aged 17 who is an up and coming young rugby player and possibly a star of the future. Matt plays for Barkers’ Butts RFC based in Coventry, in their Colts team and their first team. He is also playing for the Warwickshire County under 18s squad. Matt started playing Rugby when he was just 10 years old. He is currently at Leamington College studying visual communication and is hoping to secure an apprenticeship in graphic design.